The picture was first revealed yesterday on the blog Web site of Milwaukee talk radio host Charlie Sykes, who said he got it from a listener who had a buddy in the unit. Way to go, Charlie! This picture represents what living without peace is. I am surprised with the soldiers. I'm not sure anyone pointed this out to you, but it's in lolcat, based off of cat macros. 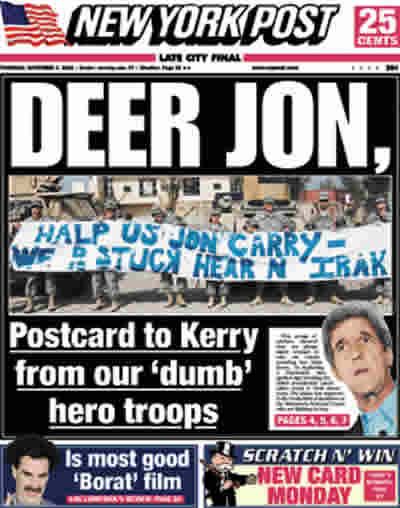 Our smart soldiers gave Kerry a swift boot.